I am short - 29" inseam short. As a result, I almost always need to hem store bought clothes, even when they are petite or short length. I used to think it was such a chore to hem up a pair of jeans, but I've worked out an easy method that saves me time and trouble. It really is easy. First of all, you'll need to figure out how much you want to shorten the jeans. Just try them on and turn them up to the length you like. I know just where I like them to fall on my foot for the shoes I wear. If you're not sure, put on the shoes you wear most often with jeans and stand in front of a mirror to see if you've turned them up the right amount. It is important to stand up straight and relaxed and look at the length in a mirror rather than bending down to see it. Otherwise, you won't get the real picture of the length when you are wearing the jeans. 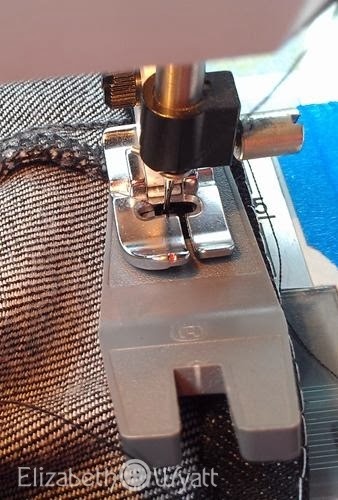 Now measure from the bottom to the top edge of the original hem. 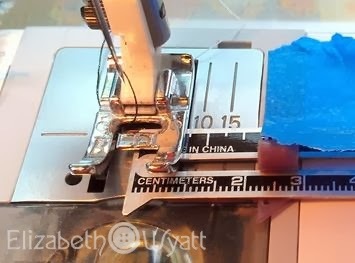 I like to use a sewing gauge with the slider to mark the measurement. If you don't have one, just use a regular ruler and note the measurement immediately. I make a big deal over writing down the numbers when I'm hemming because I've made costly mistakes in the past. As you can see, I have to shorten mine a lot! 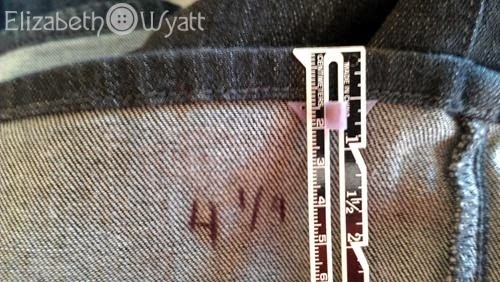 4 5/8"
I like to write the measurement directly on the wrong side of the jeans. This way I won't mix things up when I'm working on more than one pair at a time. 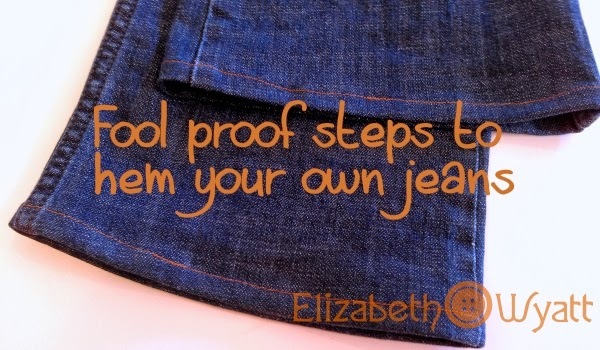 Jeans are typically finished with a 1/2" narrow hem. When you hem something, the fabric is typically turned under 2 times, completely encasing the raw edge of the fabric. 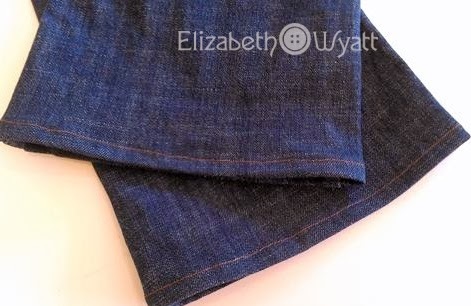 A narrow hem is usually 1/2" or less (narrow) and both of the folds are about the same size. 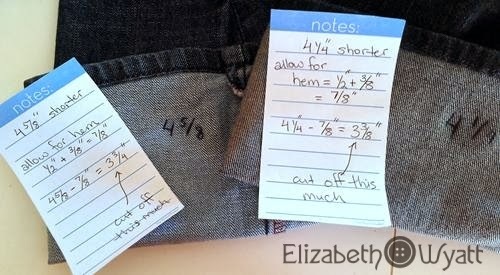 hem allowance = 1/2" + 3/8" = 7/8"
For the pair on the left, I need to cut off 4 5/8" - 7/8" = 3 3/4"
I do go to the trouble to write this out every time. It really is a good idea to make sure you cut things correctly, especially when you are measuring more than one pair at a time. 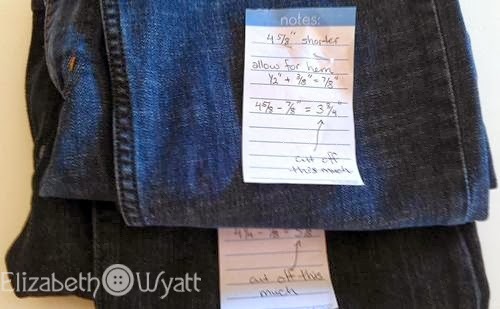 It's helpful to pin the notes onto each pair if you are hemming a bunch of jeans and might be interrupted or you are measuring several pair for the kids. Measure them all once while you've got a hold of them and then let them run outside and play. So much easier than calling them back to measure for each pair in the pile and you only have to put up with the sighs and eye-rolls in one session. When you are interrupted, it is also very nice to come back to a neat stack of jeans with notes pinned on them when you get a chance to do the sewing. Next you'll need to mark the cutting line. Remember, this line is not marking the final length of your jeans. It is where to CUT and that is 7/8" longer than the final length. Since you've written this down on your notes (you were good and did that, right? ), you'll know which measurement to mark. 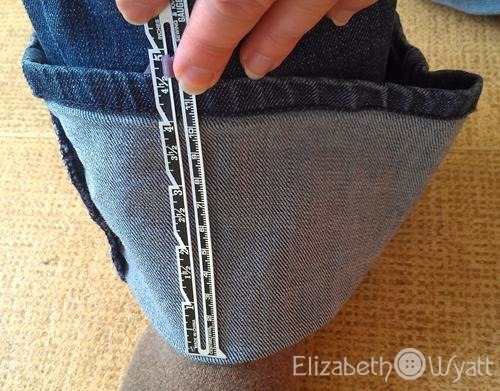 In this photo, I'm marking the jeans that I need to cut off at 3 3/8" from the original hem. I like to use tailor's chalk on dark fabrics, but you can use whatever you like. 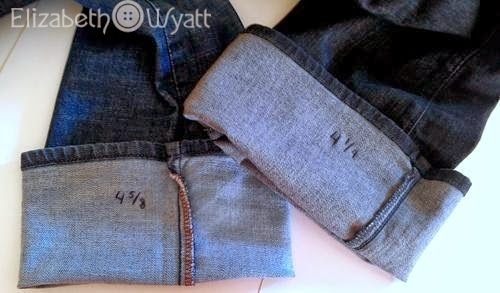 If you don't have anything to make a light colored mark, you can always turn the jeans inside out and use a regular ball point pen. It will never show when you are done. Now, the CORRECT way to do this is to turn the jeans over and continue marking all the way around and then cut through one layer all around the leg. I am lazy, so I only mark the front and cut through both layers at the same time. 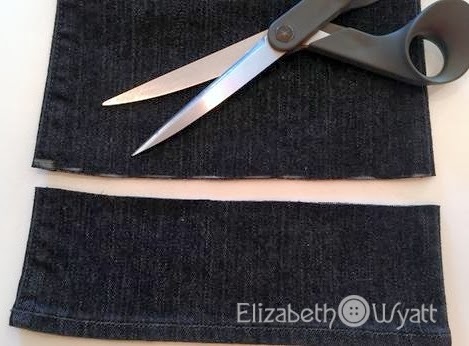 This works perfectly fine for heavy denim that doesn't shift around as you are cutting. In other words, the bottom hem on front and back stay aligned as you go. If you are working with lighter weight denim that tends to shift around a lot, you'll want to do it the proper way. Otherwise, you'll likely end up with a mess! Don't be afraid to cut! If you've written out your measurements and the amount to cut off as above, you can cut with confidence. Just cut along your marked line. For hems, it's easiest to do the marking with you sewing machine. I learned this simple, but genius tip from Liesl Gibson's Oliver + S patterns. 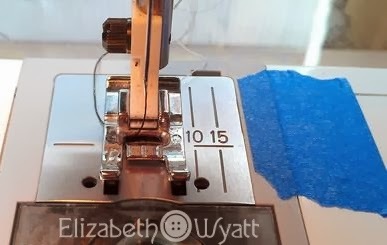 You'll sew a basting stitch (straight stitch at the machines longest stitch length) along the fold line. 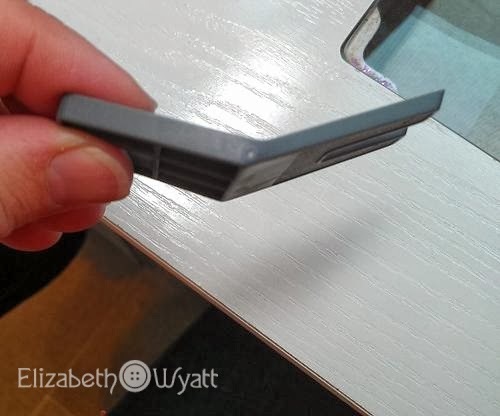 It's so simple to use the machine's seam allowance markings to make this line perfect without using a ruler at the ironing board. In this case, my machine doesn't have a marking for 7/8" seam allowance. No problem. I just measure from the center needle position out 7/8" and stick a piece of painter's tape on the bed of the machine to mark it. Now machine baste with a 7/8" seam allowance around each leg. 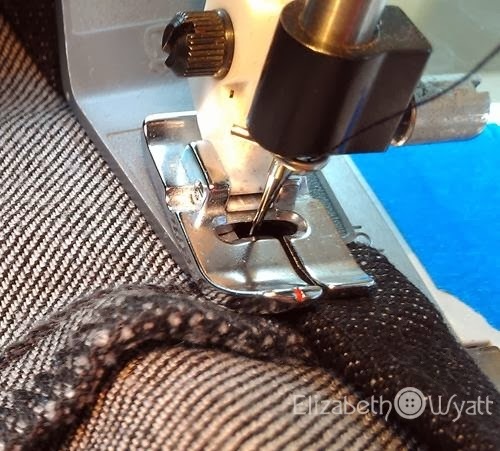 IMPORTANT: Use contrasting thread so that you can see the line of basting stitches when you are pressing up the hem. I have white thread in the bobbin here, as you'll see below. Now you have a nice fold line to use at the ironing board. 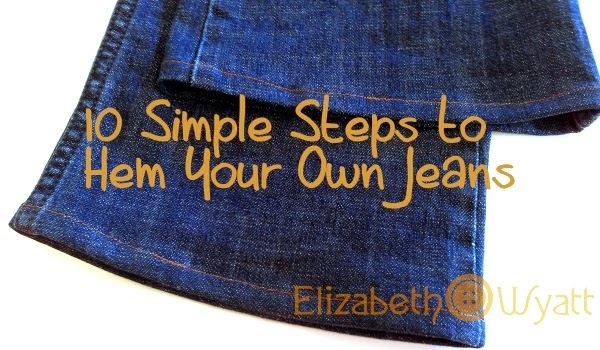 Just fold the bottom edge of the jeans on that line and press with a hot steam iron. Continue all the way around the leg. If you have a sleeve board, it is very helpful here. You'll notice that it is a bit difficult to press the hem really flat at the side seam and inseam. We'll take care of that in a few minutes. Once you've got the 7/8" hem turned up, you'll need to tuck the raw edge under so that it is nearly even with the fold. (This is the 3/8" fold). You'll be stitching along this second folded edge to finish the hem, so the raw edge will be completely encased. Press this fold with your hot steam iron. 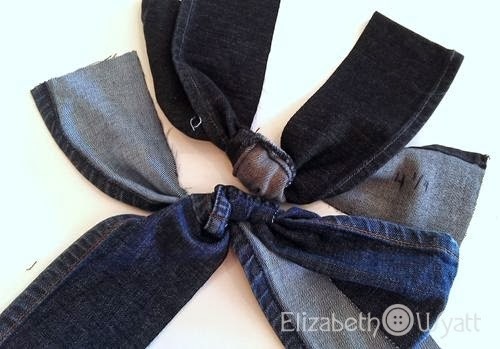 I learned this trick from my dear friend and amazingly talented sewist, Nicole of Five and Counting. All you need is your standard sewing hammer. What? You don't have a sewing hammer? 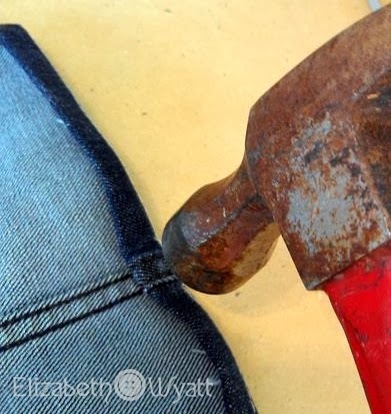 To flatten out the hem at the side seam and inseam, whack them with a hammer a few times. Works like a charm! Hopefully, you have a much less disgusting hammer. Perhaps I should buy myself a new one just for the sewing room. All that's left to do is edgestitch (top stitch really close to the edge) along the inside fold. I have a left-handed edgestitching foot for my machine. I love it and use it constantly. If you don't have one, you should put it on your Christmas list! As nice as it is, you don't NEED this kind of foot. You can use a standard right-handed edgestitching foot or just a regular foot. The main thing is to stitch pretty close to the edge of that fold. About 1/8" is ideal. A NOTE ABOUT NEEDLES: Be sure that you are using a heavy duty needle for this step. Otherwise, your needle may break when stitching through multiple layers of denim. Needles come in different thicknesses and styles for different jobs. For most projects, you'll be sewing with a #80 universal style needle. The number indicates how thick and strong the needle is. The style describes the type of fabric and/or thread it is designed for. There sharps for delicate wovens such as silk and ball point needles for sewing knits. A universal needle has a point in between a sharp and a ball point that works well for most fabrics, including knits and woven fabrics. 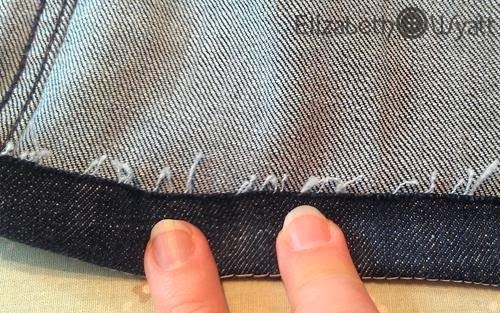 When hemming denim, you'll want to use at least a #90 size needle. There are needles sold specifically for denim and are often #100. A universal #90 us fine in most cases. 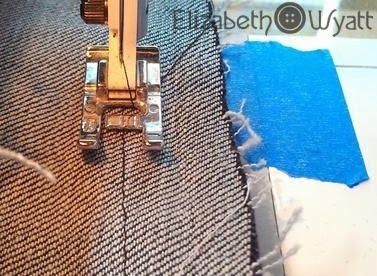 If you choose to use a heavier top-stitching thread in the needle, you'll need to use a special top-stitching needle. These needles have a larger eye (hole for the thread) to allow for the thicker thread. USE THE RIGHT THREAD: The thread you use makes a bid difference in the final look of your hem. Make sure that your bobbin is wound with the color of thread that you want to be visible at the hem. Most jeans are top-stitched with a gold or orange color thread. One of the pair that I am working on here was actually top-stitched in charcoal grey. If you want your hem to look like the original hem, match the thread as closely as you can. You can use regular weight sewing thread in whatever color you wish. There are also specific threads available for top stitching and even special ones just for jeans. Both are thicker than standard thread so that your stitches will stand out more. Just choose according to the look you want. Even though we hammered down those side seams, the hem will still be a bit bulky there. 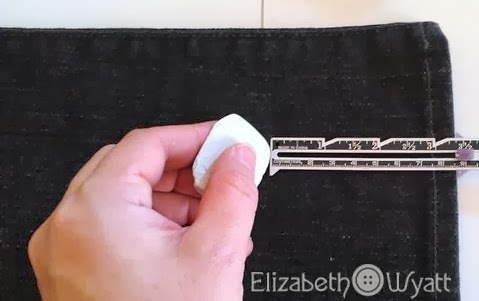 If you have trouble stitching over them, you can use a tool to help out. 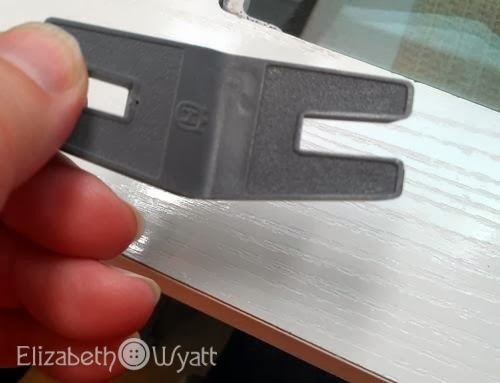 This one came with my machine, but similar tools are available for purchase in fabric stores. The purpose of this tool is to eliminate sewing up or down the "hill" when you cross bulky seams. Mine has two thicknesses to choose from. The side shown on the right is for smaller hills and on the left for bigger ones. 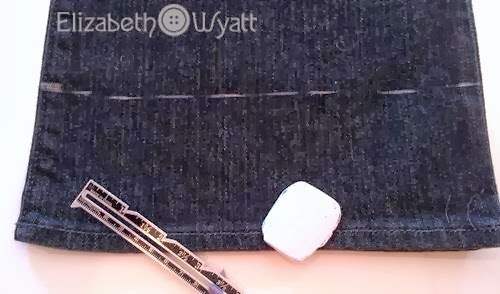 As you are sewing along and you approach a bulky seam, stop and position the needle down through the fabric. Life the presser foot and slide the tool under the foot from the back. 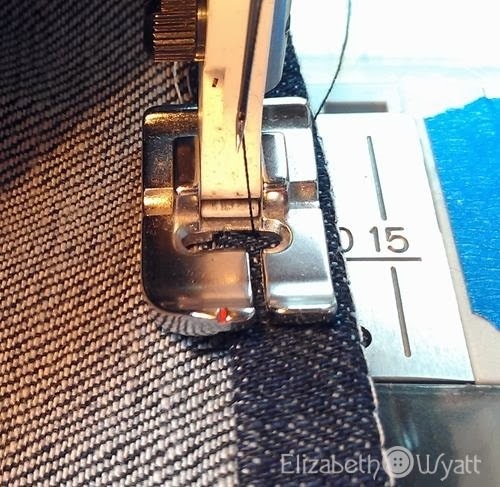 This will raise the foot enough to easily sew over the seam you need to cross. Now lower the presser foot and sew right across the seam. 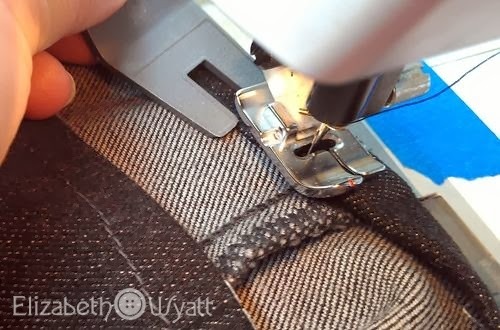 You'll sew right off of the tool and onto the bulky seam with no resistance. To get down off the "hill", stop with the needle down, lift the presser foot, and place the tool under the front of the presser foot. 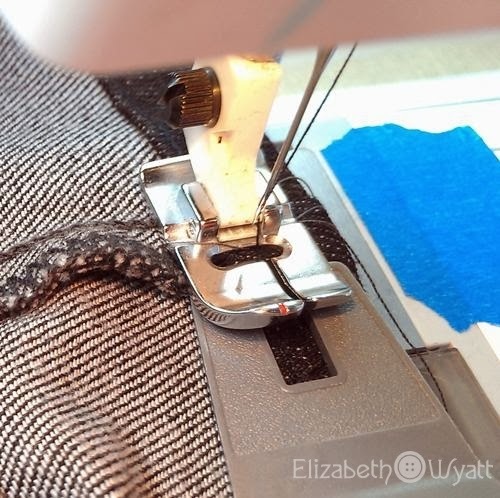 Lower your presser foot and sew until you've cleared the seam. Make sure you stop before you run into the tool! (There might be a hole in my tool from when I went too far, but we won't dwell on that). Now just remove the basting stitches you used to mark the fold line and you are all done! After several trips through the washer and dryer, your new hem will look just like the original. Wait - Don't Throw Away the Scraps! 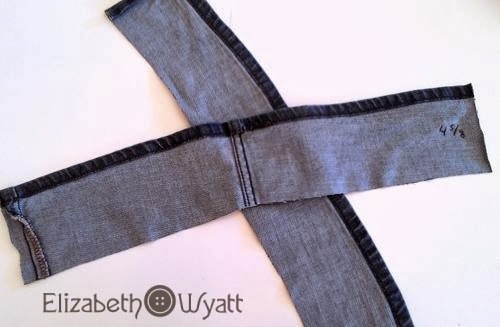 These strips of denim are great for applique, patching worn knees in jeans, etc. If you have a dog, you can use those scraps to make a new dog toy for your best friend. Cut the tubes so that you have 2 flat strips, cross them and tie. Be sure to pull really, really hard on the knot to secure it. My dog is lucky, because my scraps are pretty wide. If yours aren't, save them up from multiple projects and use more than 2 per toy. 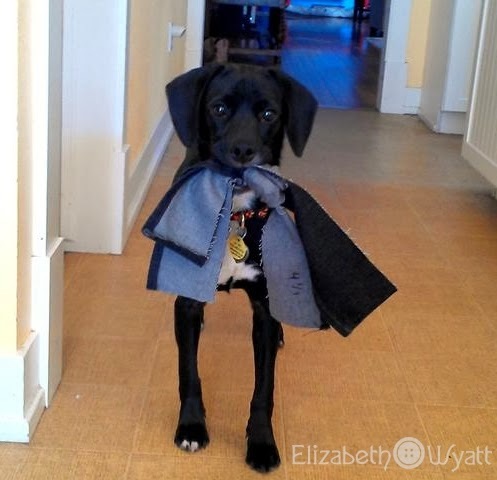 Happy me with perfectly hemmed jeans and happy puppy with his new toy.